McGuinness said that his mother was first tipped off to his association with the IRA when she found gloves and a beret in his bedroom in the family’s Derry home. He said she had been “shocked” by the revelation but “more concerned for [his] safety than anything else”. McGuinness explained that the situation in Derry during his youth not only led him to join the IRA but, ultimately, showed him that a political approach was essential in bridging the divide between communities in Northern Ireland. “We needed a political party that would represent the views of republicans in the North,” he said. McGuinness gave former British Prime Minister Tony Blair “enormous credit” for his role in the peace process. McGuinness said he has a ‘thunderbolt’ moment when Blair told to him that he considered the British authorities were “as responsible for the conflict” in Northern Ireland as Irish republicans. 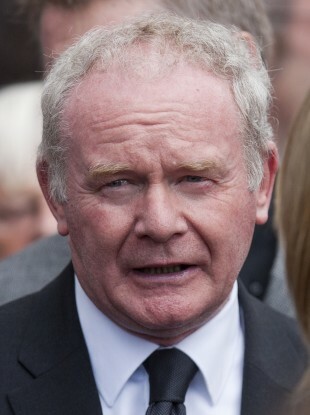 “I’ll always be grateful for his contribution and his honesty,” said McGuinness. As well as building a relationship with Blair, McGuinness said he also considered Ian Paisley a friend. “We actually get on like a house on fire. We treated each other with dignity and respect… for some reason we really hit it off, and we remain friends to this day,” he said. McGuinness was quizzed by Finucane on the IRA’s practise of ‘disappearing’ some of those murdered during the height of the Troubles – something McGuinness condemned as “terrible, shameful and wrong”. McGuiness said the practise was “one of the worse things to happen” in the context of an already very bitter conflict, and underlined that he had never been involved in such decisions. In fact, he said, he encouraged his colleagues to send families information about the fate and whereabouts of the deceased. Pushed by Finucane on the IRA’s reasoning regarding the withholding of information about people who were killed, thereby compounding the grief of loved ones, McGuinness said that “only the people who took that decision can answer” why they did so. For me there was no rationale. The arguments that they made [were] that the person [who was killed] was someone from the local area and, at a time of conflict, it wasn’t something they wanted to be publicly associated with – which was public execution. They wanted the focus to be on the IRA and British army… [not on civilians]. It’s not something I accepted and, to be quite honest, I was horrified. I think Republicans have to hold their hands up to one of the most shameful things that occurred in over 20 years’ of conflict. Speaking of his historic handshake with Queen Elizabeth last year, McGuinness said that the British monarch was “a woman who recognised she could play an important role in reconciliation” and actively wanted to do so. “I had many reasons not to meet with Queen Elizabeth… and of course she could come up with many reasons too… but we had a meeting and it was obvious to me that this was a woman who would [continue to be involved with the peace process]. I have no doubt that she believes she has a role to play in the process of reconciliation,” he said. Email “McGuinness on The Disappeared: 'One of the worse things to happen' during an already bitter conflict”. Feedback on “McGuinness on The Disappeared: 'One of the worse things to happen' during an already bitter conflict”.